Last I left you all, I was discussing the pre-op to my BladeFREE HD IntraLASIK. 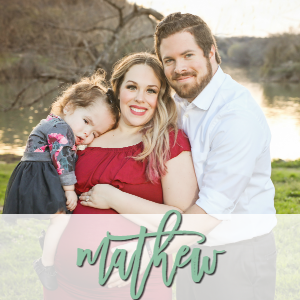 Only a week after my pre-op appointment, Mathew and I headed to Dallas early in the morning for my procedure while Addie had a nurse stay with her for the day. I was instructed to not wear any eye makeup or wear my contacts for a week prior to my surgery, so I only wore my glasses and I didn’t wear eye makeup. We arrived to the Kleiman|Evangelista Eye Center a little earlier than my procedure time for one last test, the Field Vision Test. The Field Vision Test is a test that determines your peripheral vision. I have a history of Glaucoma on my dad’s side of the family, so it was very important for me to have this test done to be perfectly sure I was a candidate for the Blade­Free HD IntraLASIK eye surgery. It was a really simple 10 minute test where I looked into a machine and there were dots popping up all around the screen. Every time I saw the dot, I had to click a little button. I had to wear a little eye patch on the eye I wasn’t testing on. Mathew may have threatened to take pictures of me looking like a pirate to blackmail me. Ha! After my test, Dr. David Kleiman reviewed my results, and rechecked my prescription to make sure that it was accurate. I was so nervous to see if I had been a candidate for the surgery. 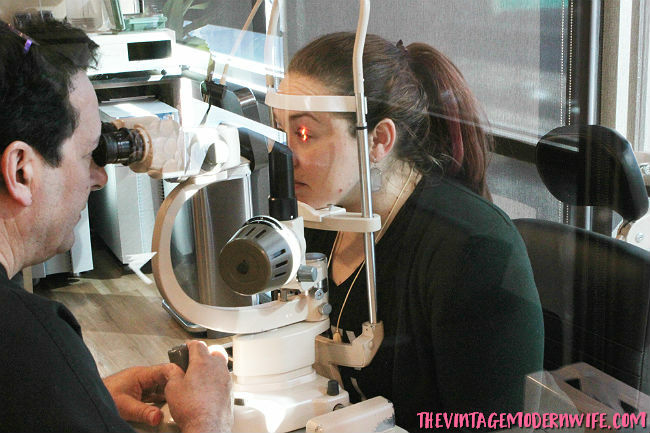 After waiting for a little while, Dr. Kleiman came and spoke with me and let me know that I did excellent on my Field Vision Test and I would, in fact, be getting the Blade­Free HD IntraLASIK eye surgery in just a bit! 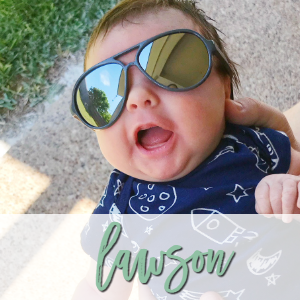 I was so excited and I was given some papers to sign before my surgery along with a goodie bag that included some papers about post-surgery care, goggles to sleep in, and sunglasses. I was also given a little Valium pill to calm any nerves before my Blade­Free HD IntraLASIK eye surgery. You guys know I use essential oils to help me relax, and I did that day, but trust me, you’ll not only want to use your essential oils. Take the pill! After I took the pill there was a little bit of a whirlwind that went on. I had nurses giving me numbing drops into my eyes every few minutes, Dr. Kleiman talked to me and made sure I was ready, and then I was taken into the operating area. What’s really cool about the operating area there’s a glass wall that separates it from the waiting room. Mathew was allowed to wait in the waiting room while the procedure was going on. 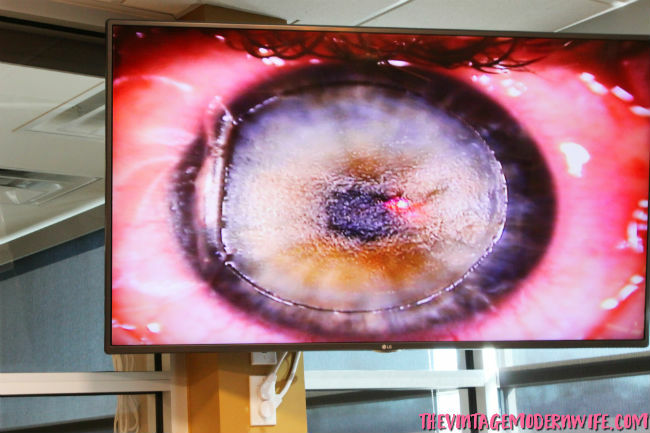 There was also a tv in the waiting room that was panned close on each eye that was currently getting the Blade­Free HD IntraLASIK eye surgery, so he could see exactly what I was going through. I had him get some pictures and he recorded a little of it too. It was really cool to see how they did everything! 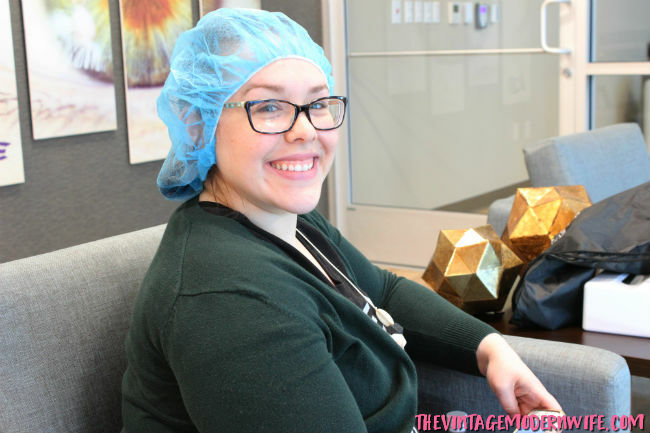 Not only that, but before the surgery, Dr. Kleiman asked me if I wanted to the bare minimum during the procedure or if I was a medical junkie and wanted every single detail. 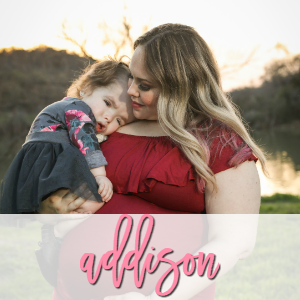 After spending 10 months in the hospital with Addie, and countless nights of falling asleep to Dr. Pimple Popper on YouTube and Dr. Miami on Snapchat, I told Dr. Kleiman I wanted to know every single detail. Besides, I think it helped prepare me so I knew what to expect before each part of the Blade­Free HD IntraLASIK eye surgery was happening. It was very comforting to know that he took the time to ask me what my preferences were in regards to the procedure. I really appreciated it. As far as the procedure itself, it’s fairly painless. The numbing drops numb your eyes so much that you don’t feel the lasers reshaping your eyes one bit. I didn’t have any discomfort with that at all, which was probably the thing I worried about most initially. However, I will say there is some moderate discomfort with the suction device they use to keep your eye still. I wasn’t exactly ready for it and it didn’t hurt but it was pressure on my eye that I wasn’t expecting. Still, it’s important that they do it so your eyes don’t move while the lasers are going! The procedure is blade free which means there’s no blade that cuts the flap. Instead, a laser does! Like I said before, you don’t feel the lasers working because of the numbing drops, so it’s really easy to relax and focus on the lights above you. Then you are moved to the second laser so they can reshape your cornea. Each eye is under the lasers only a few minutes and Dr. Kleiman just instructed me to relax and look at a light that was above me. You can see the flap done with the first laser in this picture and the second laser working to reshape my cornea. Once Dr. Kleiman was done, I got up from the chair to go get my eyes checked. I will tell you, you might feel a little dizzy- almost like you’re drunk. It’s not the Valium. Getting a change in eye shape and the pressure that was on the eye nerves causes a dizzy feeling, but it’s absolutely normal and doesn’t last but for a little while. I had some help walking to a chair and had each eye examined to make sure everything looked perfectly. I couldn’t believe it- although things were a bit hazy, I could see a dramatic difference right away! The Blade­Free HD IntraLASIK eye surgery really simple to do (from my standpoint) and I was in the operating room maybe about 30 minutes total including getting set up, doing my right eye, then my left eye, and then getting my eyes checked. It was really fast! I was brought into the waiting room with Mathew and was instructed to put on my sunglasses and just rest as much as I could. I was also given 2 sets of eye drops- one was an antibiotic and steroid and the other was a pack of artificial tears. The most important part of the healing process is using the drops, so Dr. Kleiman said to take a really good nap, then start my eye drops every hour for the first day (and then every 4 hours for the next 10 days). Moist eyes heal faster than dry eyes! I slept the whole way home with my sunglasses and Mathew’s jacket over my face. My eyes were really light sensitive after the surgery, and I actually felt as if I was crying the whole way home (I really wasn’t- my eyes were watering like crazy!) I went home and took my first set of eye drops and napped. Many people feel discomfort after the procedure and it just varies person to person with the level of discomfort. My eyes stung pretty badly so I figured a nap was for the best. I closed my bedroom curtains, put my goggles on, and slept for about 2 hours. When I woke up, I felt much better and my eyes didn’t sting anymore! Although my vision was still hazy on the outside, I literally could see a huge difference in my vision and could read labels of things all the way across the room on my bathroom counter. It was crazy! My eyes were a bit red and puffy after my eye surgery, which is very common due to the suction that is used to hold your eye still during the procedure. I was told it wouldn’t last more than a couple weeks, so I wasn’t worried. I spent the day taking it easy, using my drops every hour, and getting as much rest in as possible. By evening that day I could see a significant difference in how I could see. I honestly couldn’t believe it. I was told though that once I got an entire night of sleep I’d truly tell a difference. It was true! When I woke up the day after the surgery, I could see incredibly well. The day after my Blade­Free HD IntraLASIK eye surgery I was required to have my post-op appointment, so that was my plan for the day. I’ll be blogging about my post-op results soon, but in the mean time, check out my Snapchat story from the day I got the Blade­Free HD IntraLASIK eye surgery! You’ll get a closer look at how my day went first hand. It’s funny, the things I was worried about before the procedure weren’t anything to be stressed about. It’s been over a month now that I’ve had my Blade­Free HD IntraLASIK eye surgery from the Kleiman|Evangelista Eye Center and honestly, I haven’t looked back since I got it. It’s been great so far and I can’t wait to keep you all updated on my progress! 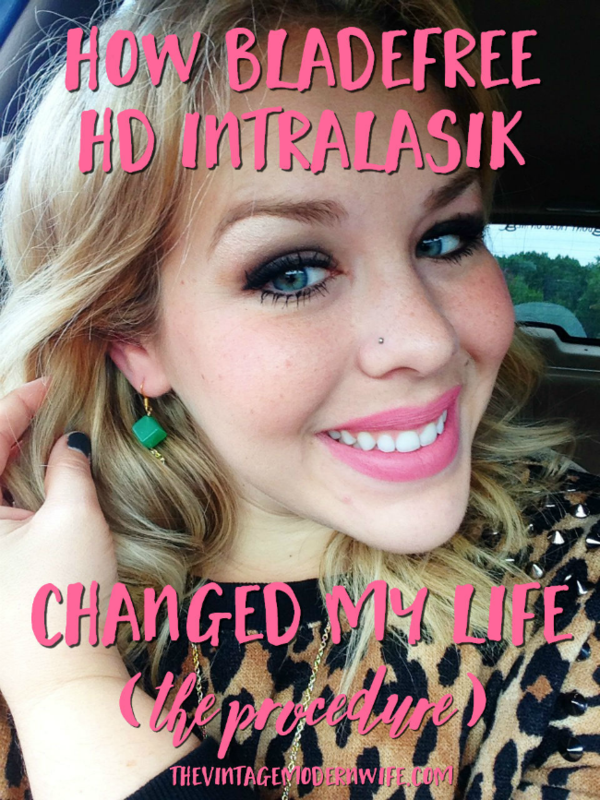 What worries or questions do you have about Blade­Free HD IntraLASIK eye surgery? Soon I’ll be having a FAQ post with any questions you might have that will be answered! Leave your questions in the comments. 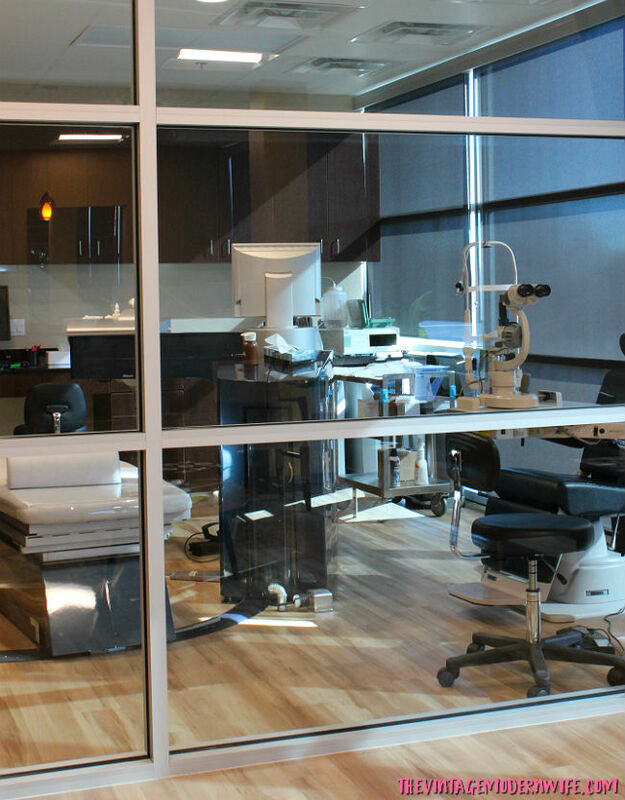 Feel free to chat with the Kleiman|Evangelista Eye Center on Facebook, Twitter, or Instagram as well if you have questions that you feel they can specifically answer for you! I am so happy for you that it went so well! This sounds SO SIMPLE. You’ve eased a lot of my fears! If I can’t get this done in 2016 it’ll be a definite for 2017! 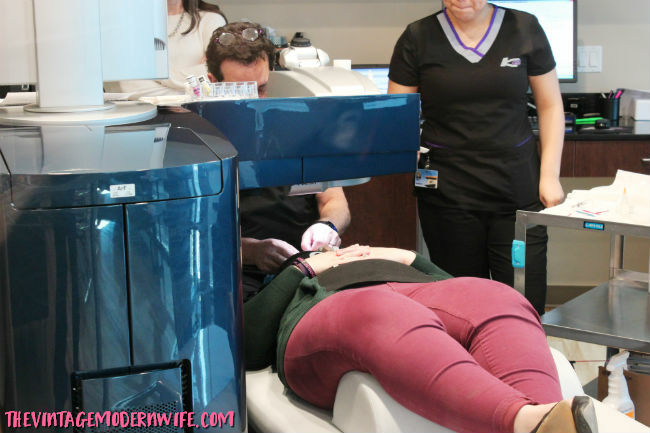 I’m so glad you were able to get photos of the procedure! That looks very similar to what I went through. It’s so life changing! My mom got Lasik and it’s so worth it! That is so awesome! I’m so happy it worked for you! I am so ready to get this done! Especially after accidentally sleeping in my contacts last night. Top notch! It sounds like the whole experience was quick and relatively easy. I’m so ready to get it done! 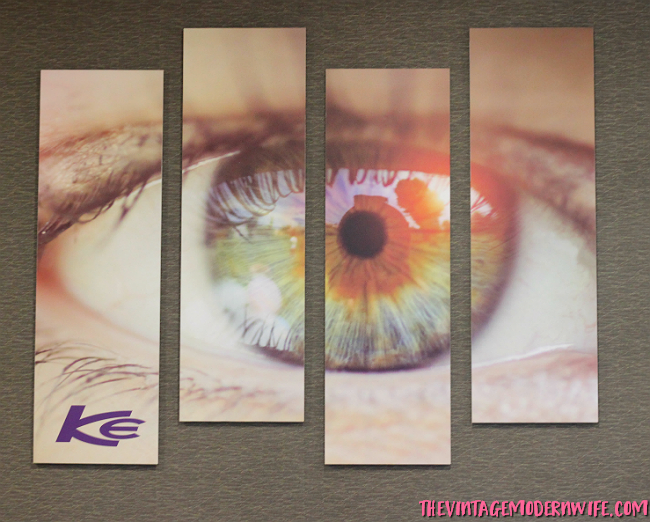 LASIK is getting more and more effective as technology continues to develop. Did you have any side effects after getting this type of corrective laser eye surgery?